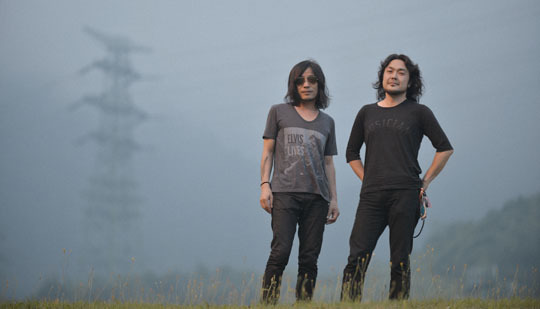 Yasunori Takada (drums): We feel great. We’re thankful to everyone who put the show together and to the people that came to watch us. And of course, the orchestra. What made you decide to add the orchestra to your recordings and performances? Takaakira Goto (lead guitar): When I compose music the first thing that I hear in my mind is the orchestra. So when I compose, I write the orchestra’s part first. Then I work on the guitars and other instruments afterward. A lot of people we’ve spoken to think I’m just adding the orchestra’s part to a rock sound, but it’s actually the complete opposite. Plus I heard you prefer “contemporary classical” over “postrock” to describe your sound anyway, right? 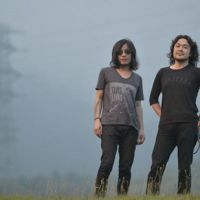 Takaakira: It’s been around 10 years since postrock became popular. And there’s been some great bands, friends included, but I think it was time to find a deeper, newer form of guitar music. We’ve never called our music postrock, but it’s great that there was that boom in the instrumental scene. Did you think like that when you all started out as a band? Takaakira: No, no, no. I first realized that classical music was instrumental music in around 2003. I was brought up in the Showa Period (1926-89) when everyone had a piano in their house. Since I was born there has always been classical music around me. My hometown is surrounded by rivers, a big sky and mountains. I listened to Beethoven from an early age, and he’s the guy who invented rock. But when we started out I loved Sonic Youth and My Bloody Valentine. I wanted to make noise music, I wanted to make a noise band, so when we began touring we’d play at really loud volumes. But since 2003 we started to change our sound, and now we have the orchestra playing with us, too. Fuji Rock also has beautiful natural surroundings. How is it playing here? Takaakira: It’s special. It’s different from other festivals. We’ve played here twice, and when we played the first song today, it felt as if we’d finally come home. All four members of the band play the glockenspiel. Is that just a random coincidence? Takaakira: It is! I love the sound, that it has a different range from pianos and guitars. It’s really dreamy. Takaakira: It’s easy to add drums to it as well. What did you keep in mind when putting together your upcoming release, “For My Parents”? Takaakira: It’s about a young person growing up and developing into a mature adult; traveling the world, finding out why they were born, experiencing many things and going on many adventures — and finally hugging their parents. Takaakira: (Smiles) It is. But it’s also something that I want people from all over the world to relate to and say “yes” to our music. Music is a bridge. People of any nationality should be able to come together and hold each other. We wanted to make something that anyone could say “yes” to. Any challenges making something so personal? Any artists you want to see at festival? Yasunori and Takaakira: Buddy Guy (They both laugh). Yasunori: He’s a legend. Got to see him. Takaakira: And we’ll also be checking out our friends Explosions In the Sky. We’ve been friends and labelmates for a long time now. What keeps you guys making music after 14 years? Yasunori: I have kids, so my family. And the band. Takaakira: Your kids are like you aren’t they? Same genes. Yasunori: Yeah, they actually came to see us today. I was really happy (Grins). Takaakira: I was a nocturnal person for the first 30 or so years of my life. I was awake only at night, and slept all day. Until I started composing. Yasunori: Oh yeah, that’s true. Takaakira: Yeah, I woke up during the daytime, and called my parents every day. I didn’t see them for about eight years. Then after our world tour, I went straight to see them, and gave them a hug, American-style. Takaakira: Yeah, my dad said, “Is this what they do in America?” (Yasunori laughs) And I realized that parents want to be hugged by their kids. Yasunori: And parents want to hold their children, too. Takaakira: But Japan doesn’t really have that kind of culture. So basically I realized I wanted to give something back to my parents through my experiences and music.